March 22, 2018 /3BL Media/ - T. Rowe Price’s tenth annual Parents, Kids & Money Survey revealed that receiving financial education in school can have a positive impact on financial behaviors years later. 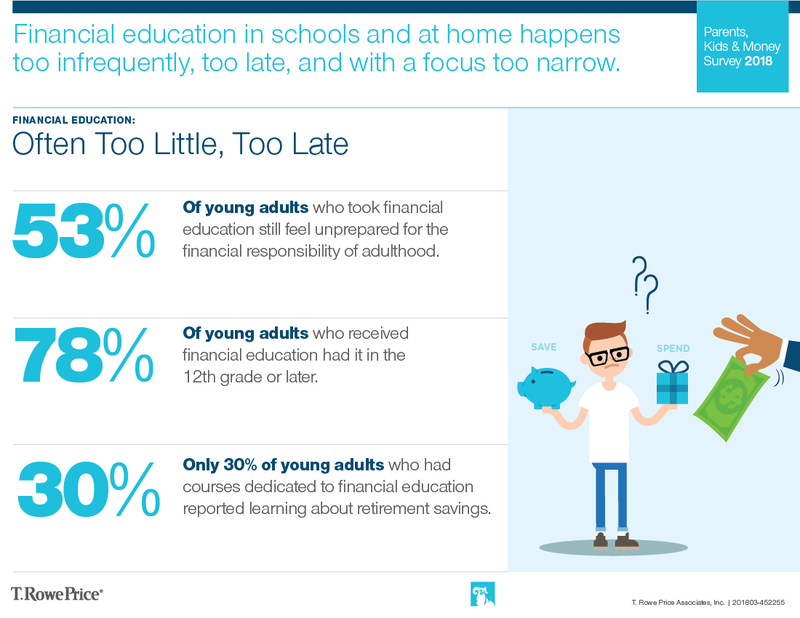 The survey sampled 1,000 young adults and found that those who received some financial education in school (59%) are more likely to have good saving habits compared with those who did not receive any financial education in school (41%). The survey, which typically samples parents of 8- to 14-year-olds and their kids, was conducted differently in 2018. For its tenth publication, the survey sampled young adults ages 18 to 24, a cohort who would have been in the age range of kids studied when the survey was first conducted. By surveying 1,000 young adults and 1,013 parents of 8- to 14-year-olds nationally, the research revealed new findings on the effectiveness of financial education in schools and homes, as well as where both are falling short. “‘Adulting’ may be a bigger challenge for those who didn’t receive any financial education at school or home as kids since they’re less likely to have a budget, an emergency fund, and retirement savings,” says Stuart Ritter, a senior financial planner at T. Rowe Price and father of three. “When I worked on the first Parents, Kids & Money Survey in 2009, we learned then that more than half of parents were worried that they could be doing more to prepare their kids to be financially competent by the time they reached adulthood. Over the years, we’ve found that financial education works best when schools and parents work together to help kids understand money matters. “Even though financial education in both school and home have shown to be effective in preparing kids for ‘adulting’ responsibilities, it’s not perfect. We noticed that financial education is often happening too late with a focus too narrow. But some financial education is still better than none. Even though only 30% of young adults who had financial education specifically learned about retirement saving, the entire cohort is much more likely to have retirement savings and say it’s a priority—that’s powerful. To help educators and parents have money conversations, the firm created MoneyConfidentKids.com, which provides free online games for kids; tips focused on financial concepts such as goal setting, spending versus saving, inflation, asset allocation, and investment diversification; as well as classroom activities. Young adults who received financial education use it: 88% of young adults who received financial education in school occasionally or frequently rely on it. They are glad they received it and think it should be required: 84% of young adults who received financial education are glad that they received it, and 86% say that it should be required in all schools. Parents have more influence than schools on financial habits: Among young adults who received financial education in school, 34% of them say that what they learned from their parents had a lot more influence on their financial habits and behaviors compared with only 8% who say that what they learned in financial literacy courses had a lot more influence. Financial education is most commonly taught in 12th grade: 78% of young adults who had financial education in school took it in the 12th grade or later. But many of them had already started earning money and had savings accounts: 52% of young adults began earning money before they turned 17 years old and 52% opened a savings account before they turned 17 years old. This trend seems more pronounced among kids today, as 54% of parents with 8- to 14- year-old kids indicated that their kids have a savings account. A minority of kids today have credit cards: 7% of parents of 8- to 14-year-olds indicated that their kids have credit cards. Among the kids who have credit cards, 55% have parents who pay the bill. Financial education classes tend to only cover the basics: Young adults who took financial education classes indicated that the most frequently taught topics in their classes were banking (69%), basic life budgeting skills (62%), credit and financing (60%), and interest (52%). Other topics that are necessary to understand to achieve long-term savings goals, such as inflation (28%), asset allocation (13%), and diversification (13%), were rarely taught. Money conversations at home are taking place later than recommended: Half of young adults who had money conversations with their parents didn’t have them until age 13 or older, including 30% who didn’t have them until age 15 or older. T. Rowe Price recommends that parents begin discussing basic financial concepts around age 5 and build on that foundational knowledge by integrating more complex topics, such as asset allocation and diversification, during the teenage years. Parents have some reluctance to discuss money matters: 66% of parents have some reluctance to discuss money matters with their 8- to 14-year-old kids. Nearly a quarter (21%) say that they are very or extremely uncomfortable discussing money. Most financial education classes don’t discuss saving for retirement: Only 30% of young adults who took a financial education class learned about retirement saving in their class. Retirement saving is rarely discussed at home: Among the young adults whose parents discussed money with them, only 36% discussed saving for retirement. Most full-time employed young adults don’t have a 401(k): Only 31% of young adults who are employed full-time have a 401(k) with their current employer. Young adults who received financial education are acting in accordance with their priorities: 48% of the young adults who had financial education have a retirement savings account, compared with only 30% of young adults who did not have financial education. Founded in 1937, Baltimore-based T. Rowe Price Group, Inc. is a global investment management organization with $1.02 trillion in assets under management as of February 28, 2018. The organization provides a broad array of mutual funds, subadvisory services, and separate account management for individual and institutional investors, retirement plans, and financial intermediaries. The company also offers a variety of sophisticated investment planning and guidance tools. T. Rowe Price's disciplined, risk-aware investment approach focuses on diversification, style consistency, and fundamental research. For more information, visit troweprice.com or our Twitter, YouTube, LinkedIn, and Facebook sites.